Tompkins H. Matteson was one of the most noted painters in upstate New York during the 1850s and was well-known for genre and historical subjects. Born in Peterboro, New York, studied and exhibited at the National Academy of Design - established himself as a portrait painter in Sherburne, New York before moving in 1841 to New York City. In 1850, he returned to Shelburne, where he spent the remainder of his life. A follower of William Sidney Mount, He blended rural genre and history painting, and his subjects included everyday historical, patriotic, and religious subjects. His subjects were taken from American history and rural life, and he is famous chiefly for his painting of The Spirit of '76. I am a long time admirer of T. H. Matteson the Painter and I am working on a book about him. I am looking for any and all information on him, including his ancestry and descendents. I was shocked to see that there is very little information at the various Genealogical Internet sites. He is certainly one of your more interesting and prominent historical Mattesons. About 10 years ago I discovered a print made from one of his earliest historical paintings called the Prayer in Congress. 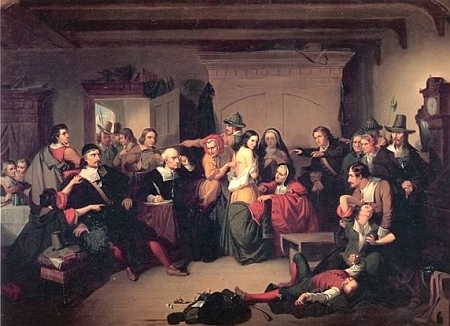 It is in fact the only early American artistic portrayal of this much forgotten and even suppressed event. I discovered it when someone was throwing it out after he couldn't sell it in his garage sale. WOW, I thought, this serves as visual proof that America had a spiritual foundation. When I researched the history from eyewitness accounts, I was even more astonished: We would not be a country today without this Prayer. It solved so many problems. It was the first time the separate states came together as one nation. This was when America was really born, not with fireworks and a barbecue, but with a prayer and the long silence that followed. We were in fact formed Under God, and yet this history has been lost from our public education, hidden in dusty old books, never a part of the public dialog, literally thrown away. I decided it was time to reproduce the print and get it back out into the world again. I have been selling it primarily through book clubs, as well as at local events in the San Francisco Bay Area. I have also placed below what basic Genealogical information I could find. I would deeply appreciate your sharing these pages with other Matteson researchers. I would especially like to talk to his descendents as they may have more stories or even old photographs of him. 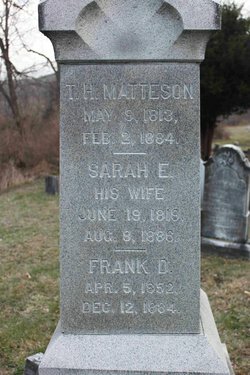 Please contact me if you have any information at all on T. H. Matteson or his descendents. Thank you. Soon he took to the life of a traveling Artist, drawing likenesses for a few pennies. He is described by an art historian of his time as "trudging wearily in the sun, faint and fasting by the wayside, sleeping in canal-boats" and reaching Albany at last, penniless and discouraged..." He joined a company of strolling players and appeared as Othello, but continued painting his now much sought after "morning pieces" of the girls in a village academy. Finally a kind gentleman of means sent him to New York City to visit the crusty old dean of American Artists, Colonel John Trumbull who first severely discouraged him, then later became an admiring advisor. Soon began the strict training program in drawing offered at the National Academy of Design. He opened a portrait studio and with moderate Success decided to marry Elizabeth Merrill. He was befriended by the Reverend Dr. Hale of Hobart College, who encouraged him to branch out into patriotic pieces, which finally brought him financial success. An admiring fellow artist convinced the American Art Union to buy his "Spirit of 76" and his "First Prayer in Congress". These were auctioned off bringing much fame to Matteson. His reputation grew and soon he hadseveral students, who would become famous in their own right. He continued with other paintings including many scenes for a pictorial newspaper showing Americans celebrating Christmas and Fourth of July. These are now considered valuable records of the life of people in the 1840's and 1850's. Today we expect Artists to be a little eccentric. Matteson was some what, but in a more patriotic way. He wore an unusual steeple-crowned hat and short mantle because of his admiration of the Pilgrims. He liked to be called the Pilgrim-Painter. His later years were full of public service: President of the School Board, Representative to the State Legislature among other activities. He died a well-respected, much loved citizen. The Spirit of'76, Washington Crossing the Delaware, Pilgrim Fathers On the Deck of the Mayflower, Justice's Court, Foddering Cattle at the Stile, Signing the Contract on Board the Mayflower, Captain Glen Claiming the Prisoners after the Burning of Schenectady, The First Sabbath of the Pilgrims, Examination of a Witch, Washington Delivering his Inaugural Address (often seen in history textbooks). --Born May 9, 1813 in Peterboro, Madison County, New York. --Died February 2, 1884 in Sherburne, New York. He is buried in Christ Episcopal Church Burial Ground in Sherburne. He, hiis [sic] wife and children rest under a gravestone designed by the artist himself. --Married Elizabeth Merrill, circa 1848. Believed to be married in New York. --Became a portrait painter in Sherburne and Auburn, New York state. --1841 moved to New York City, opened a studio and established his reputation by painting patriotic subjects. --1850 Returned to Sherburne where he lived the remaining 34 years of his life. He bought two homes next to each other, convverting [sic] one into an art studio.